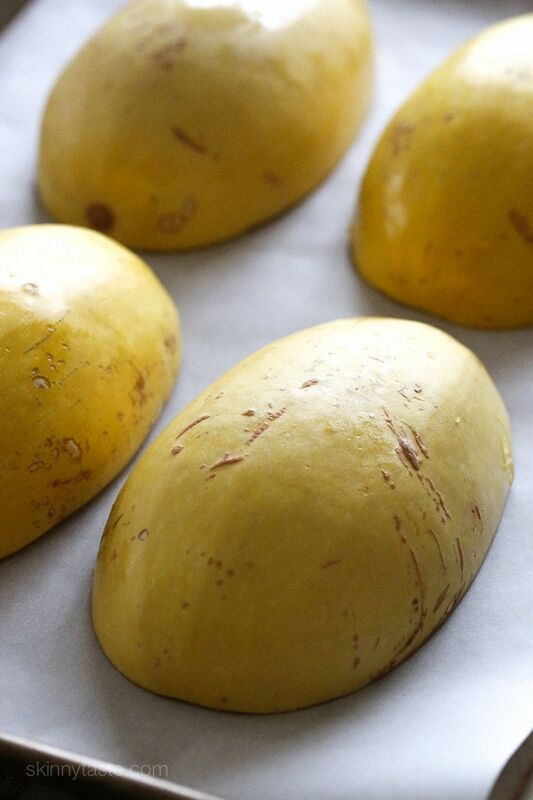 Ever wonder what to put on your roasted spaghetti squash? 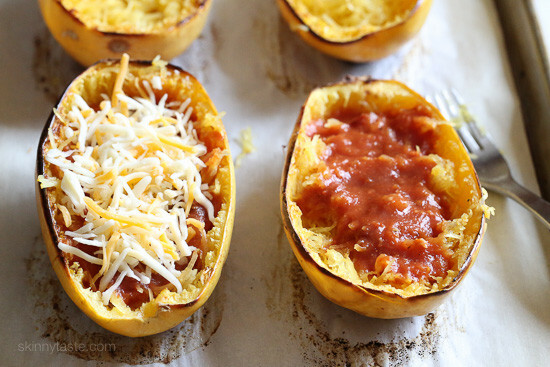 I had the idea to use my leftover enchilada sauce to make these enchilada spaghetti squash boats – best idea I had in a long time! Enchiladas are a staple in my home, I always make a double batch of this AMAZING enchilada sauce when I make my chicken enchiladas and freeze the rest for quick future enchilada nights. Yes, you can buy it pre-made in the store, but trust me it’s SO much better from scratch. These boats are so easy to make, with just 5 ingredients. I made them meatless because quite frankly, they were filling and didn’t need much – they were perfect as is! They are also low-carb, so this dish is a win win in my book! Why not add ground beef or turkey taco meat on top! Add some shredded leftover chicken to them. Keep them vegetarian by adding some canned black beans and corn. Enjoy! 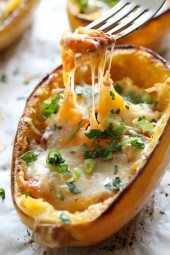 I had the idea to make these enchilada spaghetti squash boats with the extra sauce I had – best idea I had in a long time. They were so easy to make, with just a few ingredients. I made these meatless because quite frankly, they were filling and didn’t need much but why not add ground beef or chicken. You can even throw in some beans or corn. Enjoy! Line a baking sheet with parchment paper (or two if they don’t fit). Cut the squash in half lengthwise, and use a spoon to scrape out the seeds and soft yellow strands. 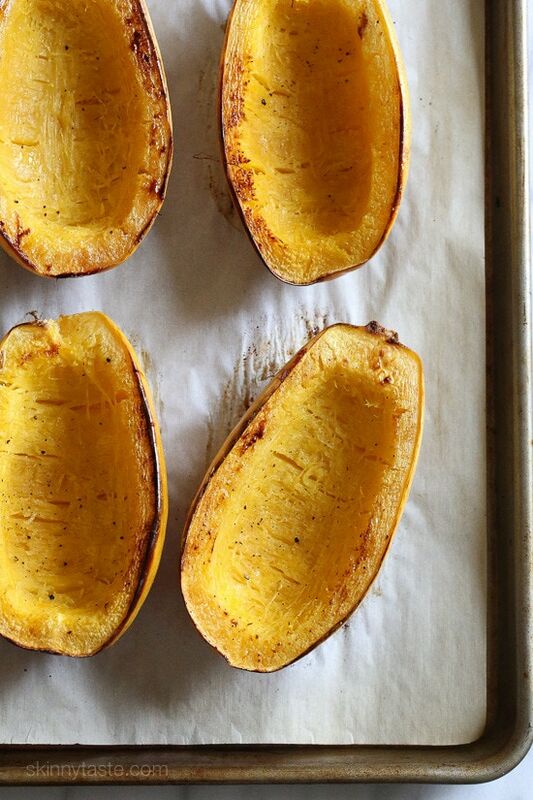 Brush the inside of the squash with 2 teaspoons of olive oil and sprinkle lightly with salt and pepper. Place the squash face down on the baking sheet and bake for 45-50 minutes or until the flesh easily pierces with a fork. Once the squash is cool enough to handle, use a fork to scrape the inside so the strands appear. Spoon enough of the enchilada sauce mixture inside each squash bowl until almost full. Top evenly with the cheese and transfer them to the oven and bake another 15 minutes, until the cheese is melted and the sauce is hot. Remove from the oven, sprinkle with cilantro and scallions and serve immediately! I am on weight watchers and absolutely love your recipes and they help with my points to give me a variety to choose from and keep going. Thank you so much!!!! I was never much of a veggie person, but I’ve been trying to eat a lot more of them and have been looking for new and fun recipes to try. I had never had spaghetti squash in my life until I found this recipe almost two years ago. This completely changed my view on squash! It was delicious and filling and I’ve made it several times. I’ve added some ground sausage and pulled chicken and no matter what I do to it it’s always a hit. I’ve had some issues cutting the squash in half, so I soften it a little in the microwave first before doing so. I just used this recipe for my very first experience with spaghetti squash! I won’t lie, I was skeptical of spaghetti squash before this. But this recipe totally quashed those fears! I modified the recipe to include pinto beans (0 points) and ground turkey (4-5 points), both of which I had leftover from making low-carb tacos yesterday! It was fantastic. The whole family loved this recipe, will make more often. Wonderful, the whole family loved it! It is a keeper. I added ground turkey 99% fat-free. It was great!!! !Tomorrow I am making the Shepherd’s Pie, Lightened up. Love the recipe. Very easy to make a head. This was SO good! I did add black beans and your embarrassingly easy salsa chicken, which increased the sp to 5, but no complaints here. It was amazing, and so were the leftovers! Thank you! Love this. I added the beans and corn you suggested and it was super delicious. And I really appreciate the new daily menus. It must be lots of extra work for you Gina but it has been a lifesaver since I joined Weight Watchers in January. 16 pounds down and much healthier with your help. Thank you! What is chocken, you ask? Yikes, I meant chicken! Wowsa! We had these tonight and they are ah-mazing! I added some grilled, cubed chocken breast and some red bell pepper. My meat loving guys approved. Thanks for the fab recipes. I add a little Cheri Ken taco spice to the spaghetti squash and put some cilantro in dish as it cooks and dice a jalapeño for some additional flavor and sprinkle on top of cheese. I made it this time as a casserole removing squash from the bowls. Also serve with a side of sour cream. OMGOODNESS!!!!! 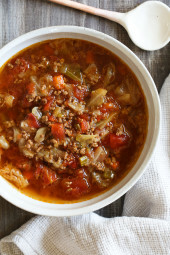 I added ground beef and LOVED, LOVED, LOVED it. Easy to make and no over eating. ???????? This is absolutely one of the best spaghetti squash recipes I’ve made. The homemade enchilada sauce is a MUST (I make a double batch and use it for this and then have it ready to make this again in the future even easier!). This turned my non-squash loving boyfriend into a happy camper and this is one he actually asks for again. We throw in some lean ground turkey (taco seasoned if we can find it) to really amp it up too. We are on Weight Watchers and the serving size on this is really fantastic for the points! We will definitely be making this again. This will become a staple. My daughter likes it, too – the enchilada sauce is perfect with it. Oh my goodness! Have been wanting to make this for awhile…tonight was the night! It turned out so good! Love the flavors…didn’t miss the tortillas! And the hubs loved it! Wonderful recipe! If I make this today and keep in fridge and reheat tomorrrow will it still be good?? Trying to meal prep.. thanks! I make this several times a month as we crave the sauce and cheese! Made this evening with a little spaghetti sauce and ground turkey. It was delicious. My first time to make spaghetti squash but it will become part of my menu planning. Fantastic! Just finished eating them. The worst part was cutting the spaghetti squash in half…those things are hard! After that it was a breeze…and delish! Love your recipes!! Made these tonight. Delicious! Added black beans for extra protein. This is a perfect weekday recipe. Thank you so much! Do you have any tips on cutting the squash? I love this recipe. My husband turned up his nose at this until he tried it. He loved it! I always feel like I am going to cut a finger off cutting through the squash. I would like to try more of your spaghetti squash recipes if I can ease my fear of cutting them. You can microwave it 2 minutes, it will be softer to cut. Do you think you could make ahead of time? Love your recipes! Some of us are visual people. Is there any way that a photo could be included? This was amazing! Only issue I had was that it was a bit watery.. I am going to try it with taco seasoning instead of sauce… maybe that will work. Though, I wonder, am I doing something wrong? Any suggestions? Made these tonight… so friggen fanfabular. Sooo good! Will be making this again. Thank you for all your wonderful recipes. I’m cooking for two adults and this is 4 servings. Will the other two servings keep okay in the fridge? Or should I just reduce the recipe for 2 servings? I made this last night! I added black beans and corn! This one is a keeper! I absolutely loved it but my children ages four and three weren’t fans. I am pretty sure it had to do with the texture of the spaghetti squash. I actually added a little bit of ground beef. My three-year-old picked out all of the ground beef and cheese and then didn’t touch the spaghetti squash. I’m going to try another one of your recipes this week with spaghetti squash hopefully it will be disguised enough for them to eat it. I need to sneak in those vegetables. At first, we were a little hesitant. 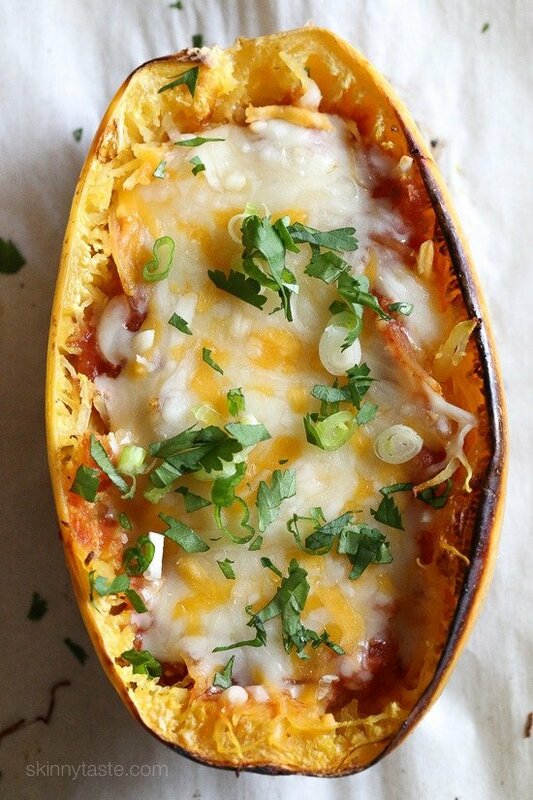 Spaghetti squash is something we haven’t really tried before, but always wanted to. This recipe seemed almost too simple, but we LOVED it. 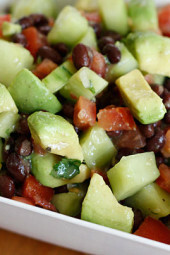 We topped with the cilantro and onion, and made some seasoned black beans to go with it. It was fantastic, and filled us up. We couldn’t finish one bowl and it made an awesome lunch the next day. The sodium is listed with the nutritional info. Made this for the family tonight. They loved it. I added ground beef. Great recipe ans super simple! I use a mild store bought enchilada sauce and add black beans and onions to bulk up the filling! These are amazing! I crave them constantly! These were so good and your enchilada sauce is to die for!!! I literally want to put it on EVERYTHING! I am doing weight watchers and am obsessed with your recipes. Thank you! Do you think this would reheat the next day we’ll in the microwave? I would love to have this at work tomorrow. Been wanting to make this and finally did tonight. Added homemade black beans, Mexican style brown rice, onions, fresh tomatoes, jalepenos and a little tempeh. Very tasty!! It was my first time making spaghetti squash (other recipes didn’t look appealing) and we loved it!! First time preparing spaghetti squash, did not like the taste! I love all yr recipes and make them often! all good! Oh my gosh! I MUST make this tonight. It looks and sounds brilliant. I can’t eat enough enchiladas-your sauce recipe is all I use now- and seriously only 4 points? Might have it for lunch AND dinner. Thanks! I made this last night and it was like heaven in a vegetable bowl! The whole family loved it. Was satisfied, and didn’t feel hungry after eating. Another great one!!! Why parchment paper? Can I use it when I roast the spaghetti squash for you recipe with cheese and spinach? Made this for dinner tonight.. However I did add chicken to them!!! They were delicious! Just made this and I LOVED IT!!! Added 1/2 a cooked shredded Chicken Breast. Can't wait to have it again! ?? We loved this! I microwaved the squash before cutting for a few minutes, and then baked at 425, which cut down the baking time to 25-30 minutes. I sautéed onions and browned some veggie crumbles and added to the enchilada sauce and topped with toasted pepitas. So good! Forgive me for being ignorant… you eat the strands you scraped from the sides, but not the actual outside shell, right? I've never eaten the outside shell of a squash, but it just doesn't really seem like much was left of the inside of the squash after you scraped everything out. If that's the case, couldn't you mix in the soft yellow strands that you took out in the beginning? Never feel ignorant for asking a question! I suspect you were a bit overzealous in scraping out the squash. Once you cut it in half, scrape out the seeds and any strands that are just beneath the seeds. Leave most of the squash flesh intact to roast. Made this tonight with black beans and corn. My husband turned up his nose when I told him what I was making. We both absolutely loved it. Thank you! I made this for my boyfriend and I last night along with a side salad. We both LOVED it! do you serve this as a stand alone dish? What would you serve with it? I haven't cooked in a long time and trying to get back in the swing of things. Everything I have tried so far my family doesn't care for. Made these tonight. Added 6 oz (total) browned ground beef–it was what I had on hand. Next time I'm going to combine more beef with the enchilada sauce. I might even do these filled with some chili. A great recipe and I especially loved the homemade enchilada sauce. I made this the day after I received this email. First, the enchilada sauce recipe is the absolute best enchilada sauce I've ever had (and I'm from San Diego, best Mexican food out there). I ate at least 3 spoonfuls while it cooled. Secondly, after I made the squash I added sauteed zucchini, corn, black beans and green onions. This made extra squash-enchilada mixture so I used it the next morning to make patties with my eggs. This recipe is AMAZING and I insist you try it as soon as possible!!! Thank you!! I always have enchilada sauce on hand because I agree, it makes everything better! stupid question. do you eat the whole squash? Made this as a side to fish for dinner. It is delicious! Might try it as a main dish with black beans and chicken. LOVE it! I'm a bit confused. What is "the enchilada sauce mixture"? I have made your enchilada sauce several times and we LOVE it. This was a great foundation for a yummy and interesting dinner! I added ground turkey, chopped onion, black beans, corn, cumin and cayenne – sauteed them together and then added a little enchilada sauce to moisten. Filled two squash halves and saved the rest of the filling for tacos next day (which was also great!). I loved the contrast of the squash with the filling. Do you think these would freeze well? How would you reheat? I made this last night, and it was amazing! I added ground beef and seasoned it with some onion powder, cumin, and chipotle chili powder. It was PERFECT. My boyfriend and I both loved it and were so full! what do you do do to the ground turkey if you want to add in a little meat? Should I season with anything? Salt and cumin would be great. I used Skinnytaste homemade taco sauce recipe and it was amazing! Tried these tonight with the addition of chicken, corn, black beans, and avocado. They were great! And so simple 🙂 I forgot to lay parchment paper before baking the squash and paid for it with a burned mess on my cookie sheet- so fellow cookers, don't skip that step! I made this last night…sautéed some red peppers, onion, corn and black beans to add though. So yummy! Wow, looks really tasty. I am going to try this soon. And thanks for sharing. Made this adding chorizo sausage, ground turkey, black beans and onion. Just cooked it all together on the stove and stirred in the enchilada sauce, and then followed the recipe from there (almost like Gina's zucchini boat recipe). Very delicious and a great use of squash. I find that if you don't overcook the squash, it is much less watery. for me, I roast it in the oven for 45 min, cut side down. Thanks Gina! I love the weekly menu's you have been publishing!! Thank you! Going forward, will you be updating the WW Points Plus values to the new SmartPoints? Yes, I've updated most of the recipes. I made this …with a twist. I used pizza sauce and low fat mozzarella cheese. VERY good! Just had this for dinner. Added black beans and onions to the enchilada sauce and it was great! I had a big spag squash so I'll be eating it for lunch tomorrow too! This is such a great idea! Thanks so much. I also had a problem with Pintrest tonight trying to open a pin for another Skinnytaste recipe. They said it would lead to spam. I can't wait to try this recipe. I love your recipes! Tried to pin this for future reference to Pinterest, but get a message that it can't because it leads to spam. Have you had problems? 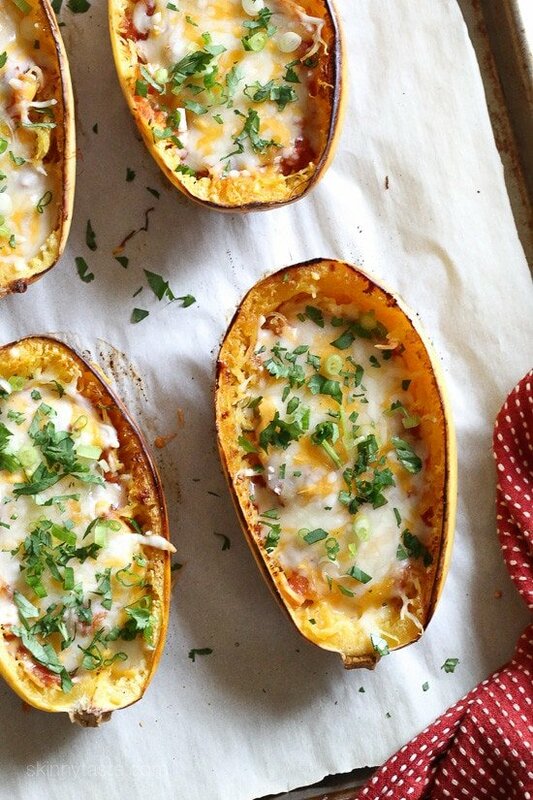 I LOVE your spaghetti squash boats/bowls! Make the chicken one all the time 🙂 Excited for an enchilada version! I may have to add in some meat for the hubs! I made this last night – Wow! Happened to have a spoonful of leftover turkey taco filling from a few nights ago, so added that to the cooked squash along with a spoonful of black beans, enchilada sauce, sprinkle of lower fat Mexican cheese, and lots of scallions. Filling and really satisfying. Loved it! Ever try with canned tuna fish for added protein? In my quickest turnaround of a Skinnytaste recipe ever, I just made this for lunch and it was a huge success! Fiancee loved it, and we are both feeling really full! In reference to an earlier question, mine did not get watery at all – maybe because of baking it face-down the first 50 minutes? Looks awesome! Just wondering, does baking it another 15 minutes keep it from getting watery? I always seem to have that problem with spaghetti squash. 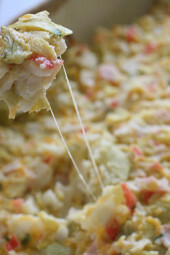 Another great recipe idea, it goes into my menu rotation for sure, thanks for sharing! I'm going to try your enchilada sauce soon and I'll be putting it on spaghetti squash! Could you add chicken to the recipe? Sure! Shredded chicken or sauteed ground chicken would be great. Would you tell us what kind of chicken how to cook it and how to apply it?! Do you have a link/post for your homemade enchilada sauce? This is all such a great idea! I'm so excited to see this! I saw your Instagram post about it and now I can't wait to make it! arella cheese on them. I may sprinkle dried basil on the top but only because I don't have the fresh.